This small, prairie fern was entirely unknown to science when it was first discovered on Frenchman's Bluff in Norman County in 1986. It was officially described as Botrychium gallicomontanum in 1991 (Farrar and Johnson-Groh 1991). As of 2008, it has only been found in two western Minnesota counties, Glacier National Park (Montana), and the Black Hills (South Dakota). The site in Norman County consists of over 500 plants and the site in Kittson County consists of less than 100 plants. Extensive searching in western Minnesota has failed to locate any additional sites. The two Minnesota sites supporting B. gallicomontanum are believed to be potentially vulnerable to a variety of threats, including natural stochastic events. Research is underway to determine the species response to typical prairie management activities. Botrychium gallicomontanum was listed as an endangered species in Minnesota in 1996. Many Botrychium (moonwort) species are difficult to distinguish from one another, and B. gallicomontanum is no exception. It closely resembles B. campestre (prairie moonwort), B. spathulatum (spatulate moonwort), and B. minganense (Mingan moonwort), but can be distinguished by leaf characteristics. The space separating the pair of basal leaf segments from the leaf segments directly above is much greater than the spacing between the upper pairs of leaf segments. Another distinguishing leaf feature is that B. gallicomontanum's leaf segments are more strongly ascending, lower leaf segments are less symmetrical, and the sterile frond is distinctly stalked (Farrar and Johnson-Groh 1991). In Minnesota, B. gallicomontanum occurs on dry, sandy to gravelly prairie, on all slope aspects, and in dense as well as sparse prairie vegetation. This rare fern produce two leaves, one fertile and one sterile. Fertile leaves produce spores, which upon germination become unisexual or more often, bisexual plants. 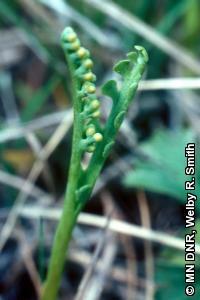 Fertilized eggs grow to form another fern, which in turn produces spores. Germinated spores of the ferns may exist underground for some eight years or more. Hybridization and nonsexual reproduction such as apogamy, apospory, and vegetative reproduction are not unusual in ferns. It is suspected that B. gallicomontanum may be a hybrid between B. campestre and B. simplex (least moonwort) (Farrar and Johnson-Groh 1991). The best time to search for B. gallicomontanum is from the first week in June to early July, when aboveground plant parts are most abundant. The continuing loss and degradation of native prairie habitat in Minnesota is likely the greatest threat to this species. The future of B. gallicomontanum may be dependent on active and appropriate management of the two sites where it is known to occur. The fact that it is not found on the heavily grazed pasture adjacent to Frenchman's Bluff suggests that grazing cattle on prairie remnants would damage or destroy the species. Herbicide application is a known serious threat. At one of the two sites that harbor B. gallicomontanum, 40%-80% of the plants were damaged by herbicides. This species is not found in the Quercus macrocarpa (bur oak) and Populus spp. (aspen) woodlands adjacent to Frenchman's Bluff, which suggests that carefully timed prescribed fire could be useful in maintaining the open grassland habitat that appears to favor this species. But poorly timed prescribed fire can adversely impact the population; no B. gallicomontanum plants were found in the year following a growing-season burn in 1987. The species did steadily increase in numbers in the next decade (Farrar and Johnson-Groh 1991). Prescribed burns should only be done during the dormant season, specifically in early spring before the plants emerge from the ground. This is a diminutive and obscure plant. University-level research continues on B. gallicomontanum and other moonworts, increasing the understanding of the ecology and genetics of the Botrychium genus. But the information is just emerging and still incomplete, necessitating further studies. Of the two sites where B. gallicomontanum occurs in Minnesota, one is in a State Park and the other on property owned by a private conservation organization. This presumably imparts a certain level of protection for this species, but management plans need to be designed with the needs of this species in mind. Ongoing documentation and assessment of this species' response to management approaches should inform the future conservation of B. gallicomontanum. Cobb, B. 1984. A field guide to ferns and their related families, northeastern and central North America. Houghton Mifflin Company, Boston, Massachusetts. xv + 281 pp. Farrar, D. R., and C. L. Johnson-Groh. 1991. A new prairie moonwort (Botrychium subgenus Botrychium) from northwestern Minnesota. American Fern Journal 81(1):1-6. Lellinger, D. B. 1985. A field manual of the ferns and fern-allies of the U.S. & Canada. Smithsonian Institution Press, Washington, D.C. 389 pp.